A wander through the woods and fields is an excellent way to get in touch with the divine — if you are a pantheist. Pantheism affirms “the animating spirit of nature” (193), and that “God is the unified totality of all things.” Pantheism is one of several systems of thought and belief that aligns with a sublime respect for and even adoration of nature. Pantheism is in the company of contemporary Polytheism and Paganism. It’s also present as people talk about digital technology. “The personalization, perceptualization, and sensualization of the experience of God may even lead a reversal back to premonotheistic spiritualities — polytheism, pantheism, paganism — resurgences of which have already been observed in Europe and America” (35). Sharing and communion also come into play: “The power of the internet will allow us to share our spiritual images, our dreams of God, with everyone around the world, in a truly universal church, experienced as a communal dream.” This digitally enhanced revival de-privileges conventional organised religion. Indick stops short of attributing this divine connectivity to electronic networks and the Internet of all things, but he does endorse a transition to a blissful state of transcendence: “In due time, we will devise simulators that will bypass our conscious mode of perception, tapping directly into our unconscious awareness, the dark hidden space within, in which spiritual perception is not inhibited, and is ready to be retrieved and enhanced. The digitally fueled inward journey into the kingdom of mind will at last reveal the truth of Jesus’ proverb: ‘The kingdom of God is within'” (35-36). The narrative is familiar and accords with other ambiguous alignments of the digital world with philosophy and religion via the singularity, super-sensible hive minds, mind-melds and other techno-utopianisms. From my point of view, digital pantheism provides a further example, if we needed it, that the digital world and the world of nature are not so far apart — at least in the way some people, for some of the time, talk about them. Sprigge, T.L.S. 1997. Pantheism. The Monist, (80) 2, 191-217. 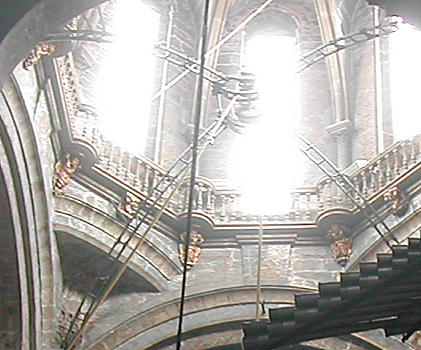 The first image is of the dome at the crossing of Santiago de Compostela, Spain. The second is a bee in Derbyshire.